Nicaragua's President Daniel Ortega and his wife Rosario Murillo, who is also vice-president, opened on Thursday the US$16.5mn Las Piedrecitas overpass in Managua. The overpass was funded by Managua municipality, according to local press reports. Set to benefit 50,000 users which transit daily on average through Managua's western access, the infrastructure will reduce travel time from 45 to 5 minutes. The overpass is comprised of two ramps: one 650m long and 15m high, and another one is 9m high and 475m long. They will improve the junction that connects Managua and Ciudad Sandino, and the old and new highways to León. Mexican construction firm Facosa won the contract in 2016. 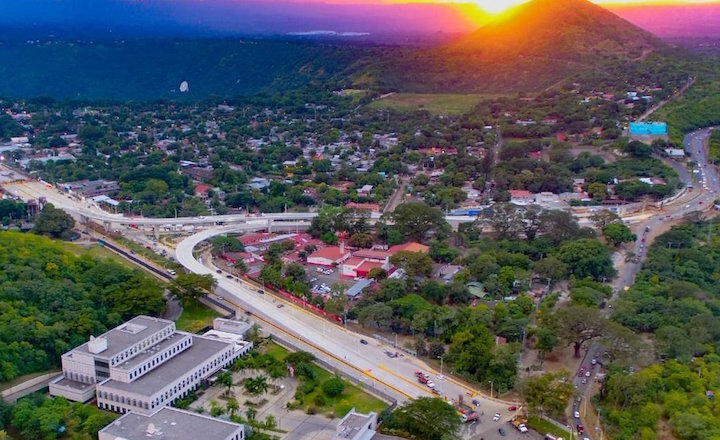 The company also snatched a contract for building the 7 Sur overpass, which was supposed to be built simultaneously with Las Piedrecitas to improve traffic along Managua's Sur highway. Originally, the project deadline was May 2017, local paper La Prensa reported. Given that the 7 Sur overpass is still under construction and expected to be completed sometime during the first quarter of next year, traffic congestion in the area will continue for a while. PICTURED: A view of the overpass. CREDIT: Alcaldía de Managua Twitter account.